Served in our Drawing Room, Gilbert’s Restaurant or the Library Bar dependent on bookings. Enjoy an Afternoon Cream Tea with delicately prepared hand-made sandwiches, cream cakes, scones served with clotted cream and jam, and a wide selection of teas and coffees. With a relaxed environment and overlooking the terrace and croquet lawn, our bar offers the perfect place to unwind. We have over 40 Single Malts available, cocktails, wine and champagne by the glass. 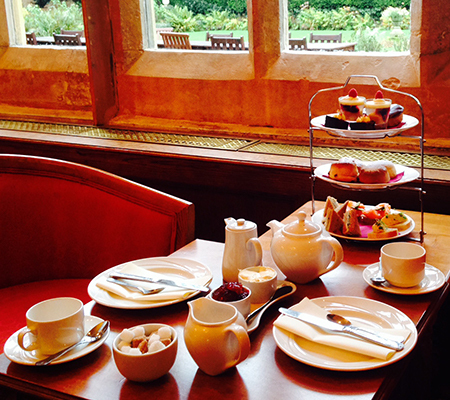 Our Afternoon Cream Teas offer great value in beautiful surroundings. We can also offer an Afternoon Cream Tea as a private function at £26.95 with exclusive use of one of our banqueting suites. Please refer to the Private Parties Section for more details. Menus and prices displayed on this website are subject to availability and may change without prior notice. Subject to availability/changes to vintages. For tables of 6 and over, we will require 1 weeks notice for complete cancellation. In all cases, we require 24 hours notice to amend a reservation. If there are any cancellations or amendments outside of these time-scales there will be a cancellation fee of £5 per person. For a no show there will be a charge of £10 per person. A separate deposit and cancellation policy applies to our Private Dining Room and will be confirmed at the time of the booking. Booking for Afternoon Cream Tea is essential and booking in our Restaurant is advised.